When using this panel for the rear application do not install tightly to the side panels. Allow 1/4" gap for expansion contraction to avoid premature cracking. Please pick large or small brick pattern from the drop down box. 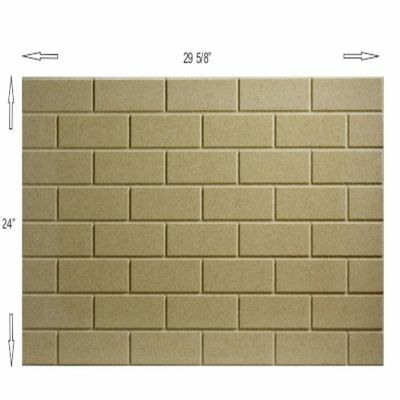 Small Brick Pattern - 3" x 8"
Large Brick Pattern - 4" x 8"
Fits back, left or right. Panels are easily cut with a skill saw, saber saw, or utility knife. Cuts much easier than concrete refractory panels. We do not cut to custom sizes. Order multiple panels to cover larger areas. Can be altered to fit all fireplaces including Marco Fireplaces. Vermiculite is a naturally occurring non-combustible mineral of the 3-layered silica group. The expanded form of vermiculite is mixed with inorganic binders and pressed into durable refractory boards. There are no fibers or other hazardous materials added. The product is odor free and will not create any off-gases when heated. The boards are strong and durable to 2,012⁰F. Disposal as produced is ecologically “friendly”. Granulated after use, it can be mixed with compost material or as a soil additive for moisture retention, aeration, and beneficial mineral additions. Original or replacement firebox liner, baffle, insulation for fireplaces, pellet stoves, boilers, and bio-mass heaters. Veneer old refractory materials. Suitable for zero clearance fireplaces where the R-Value of the material being replaced is equal to or lower than the R-Value of Thermax Panels. Fire protection – such as steel beam cladding, fire door cores, and laminated construction panels and surrounds. Thermax Boards have considerably lower heat capacity than higher density Refractories, such as fireclay bricks and precast shapes. The heat remains in the combustion chamber and speeds ignition and contributes to complete combustion, lowering emissions and ash volume. The Thermax lined heater remains clean: will not as readily build up with soot and ash. Vermiculite Refractory Panels are suitable for various domestic heating appliances. Because of their insulating properties and durability, vermiculite panels play a dual role of heat containment and heat reflection to enhance the desired performance of the appliance. These panels are often used as baffles and burner plates. The recommended density is 600 (37 pcf) for baffles, pellet, and gas fired appliances, 750 (47 pcf) for wood burning applications. Higher density = Higher strength. Caution: Thermax Vermiculite panels are not suitable for all wood-burning applications, for example, the floor of a fireplace. Care must be taken when placing logs into the fireplace so not to impact the panels.